About three miles south east of Whitchurch in rural Shropshire is an area known as Prees Heath Common. Throughout its long history the common has seen many changes. In 1915 it was used as a training base for the British Army in trench warfare training . As WW2 broke out the common became an internment camp for screening Austrian and German refugees and in 1942 an airfield was built on the site and named RAF Tilstock. Today part of the airfield is used for parachute jumping and the common is a Butterfly Nature Reserve. Few people know that after 1946, when Tilstock airfield become redundant, the abandoned buildings on the various sites dotted around the southern side of the airfield, some up to a mile away from the main runway close to Prees Higher Heath, became home to Polish Army families. 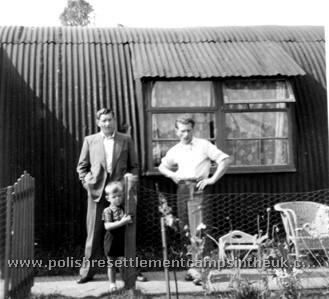 The sites that were used for housing Polish families consisted mostly of corrugated metal nissen huts with communal ablution blocks and a number of concrete huts. 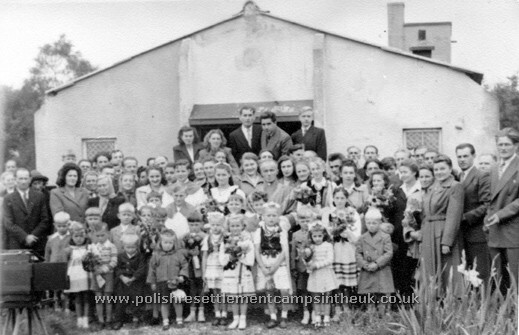 On one of the sites was the church and a communal entertainment hall, which where used by all those living in the camp. The camp was administered by the National Assistance Board and, in all the archive material I have seen, it is referred to as Tilstock. 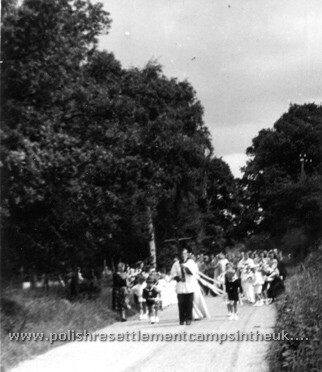 Later the administration of the camp was passed on to the Local Authority and become known as Prees Higher Heath Polish Hostel. 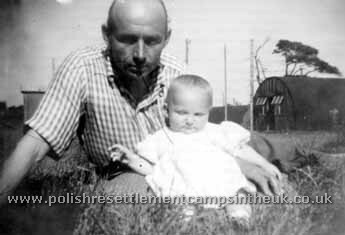 Eventually the local authority built council houses for the Polish families on what used to be known as Site 21. 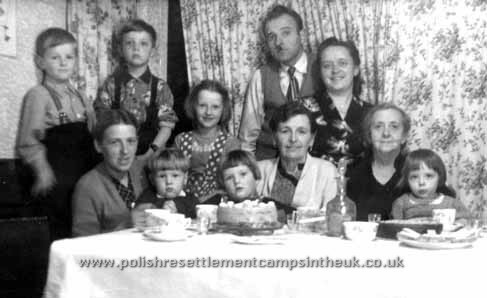 In 1940 my Grandparents Helena and Stefan Batowski with their three children Tadeusz, Irena and Krystyna and thousands of other Polish families that lived in eastern Poland were deported by the Russians in to the depths of Siberia as slave labour. My grandfather was taken away by the NKVD and was not seen again, presumed murdered by them. In 1941, after Germany turned and attacked Russia the Soviets became our allies and joined the West in fighting the Germans. For a few months there was a brief amnesty and the imprisoned Poles were released and, under the leadership General Anders, formed the Second Corps of the Polish army. Our family was able to leave Russia as army dependents and travel with the army to Persia. Tadeusz joined the army and went on through the Middle East to fight in Italy. Civilians like my grandmother and mother were sent to camps in British colonies in Africa and India. 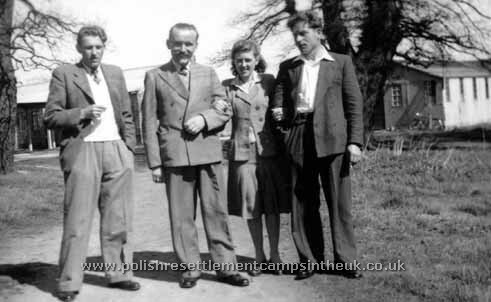 After the war Tadeusz came to the UK with his army unit and was sent for treatment in Polish Hospital no. 4 Iscoyed Park. 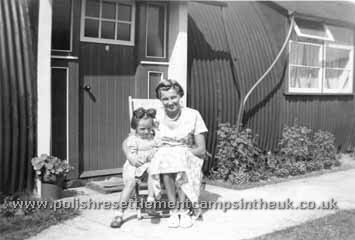 My Grandmother and Irena came to the UK on June 28th 1948 on the Carnarvon Castle and were sent to Daglingworth camp nr. 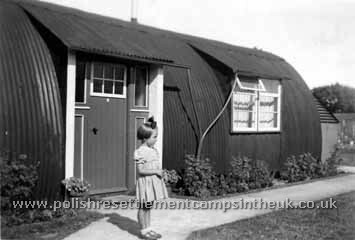 Cirencester which, at the time, served as a transit camp where incoming families were processed and allocated places in one of the many camps throughout the UK. 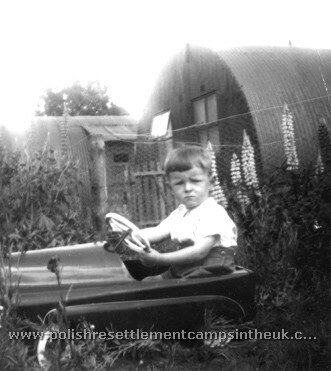 My mum and grandmother, with their belongings, were loaded on a truck and were going to be moved to a camp to which they had been allocated but she wanted to go to Tilstock (Prees camp) near to Whitchurch as it was the nearest family camp to Iscoyd Park Polish Hospital no. 4, where her brother was having treatment. She went to the Commandant of Daglinworth and explained to him the situation, the commandant told her that if she and my gran unloaded all their belongings from the lorry, he would send her to Whitchurch to be with her brother. The man that became my father saw my mum struggling with all the luggage so he help her unload. His name was corporal Stanisław Chajdas, he served in General Anders 2 Corps and saw action at Monte Cassino in Italy. His photo appears in the book "Bitwa o Monte Cassino". After arriving in Whitchurch, my gran kept telling my mum that she must write to Pan Stanisław and thank him for helping us but there was no need as "Pan Stanisław" made the first move and somehow managed to get lifts from Cirencester to Whitchurch to visit my mum. 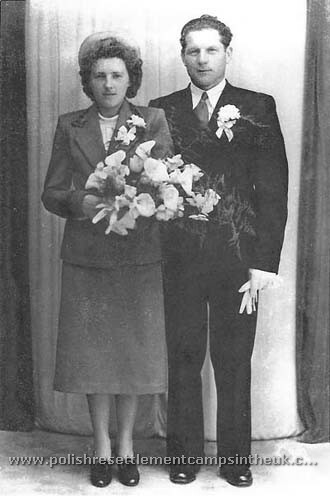 They married in 1949 and moved into Prees Camp. My sister Jadzia was born the following year on the 9th of Feb 1950 and two years later on the 11th April 1952 I came onto the scene, followed in succession by my sister Basia and brother Roman. 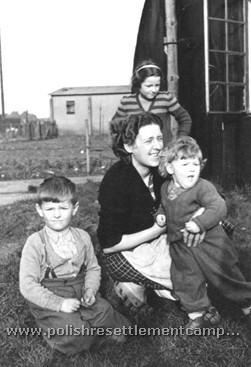 My mother was very happy living in Prees camp despite the hardships and primitive conditions. She had her family around her and Iscoyed Park hospital within easy reach, about 15 miles, which meant that she could visit her brother Tadeusz quite often. On the left is Tadeusz, man in the middle unknown, my mother Irena and father Stanisław on one of their visits. 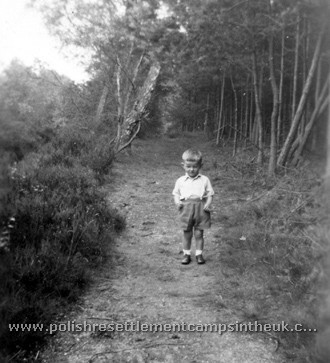 After treatment Tadeusz was discharged from Iscoyed Park and moved into Prees camp. There he met and married Izabela Dychton and in time they had 2 children Zenon, and Jasia, After the traumas of war that my grandmother and her children endured, it was wonderful for her to see her children marry and have children of their own and so we became a large family able to support each other. There were several sites used for housing displaced Polish people. We were quite lucky were we lived on site 8 in Hut 11 because it was next to a farmer's field with a wooded area around it. The field and woods, to a little lad, seemed a big place to play in. My cousin Zenon Batowski (my mum's brother's son) and a few other lads from our site were always playing in the field, that is, if the farmer wasn't growing anything on it. Andrzej in the woods by the camp. Although the different sites in the camp were joined up by pathways, children were encouraged not to wander off to other sites so, other then meeting them in church on Sundays or at some communal function, I had little contact with the children of the other sites. Some times though, when my mum and dad went to work and there was no one at home to look after me, I was taken to one of my mother's friends that lived on site 10 to be looked after. This did not happen very often so I do not remember very much about the children that lived on that site. 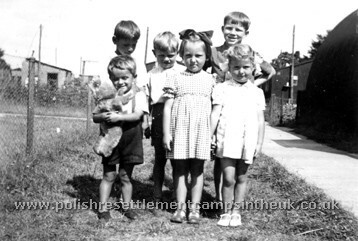 When I was about six, in pursuit of work, my parents left the camp and moved to Huddersfield in Yorkshire. There I finished my schooling, joined the army and was sent to Germany. 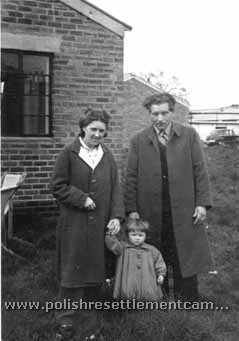 On my return I found living at home with my parents was not an ideal situation for a young man and I moved back to what I now call my roots in Shropshire. 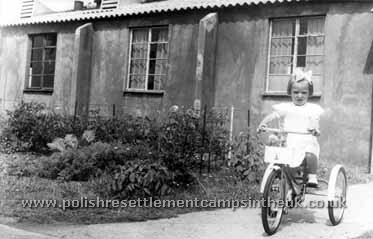 Prees camp closed in the late 1950s after the local authorities built new houses on site 21 for Polish families still living in the camp. 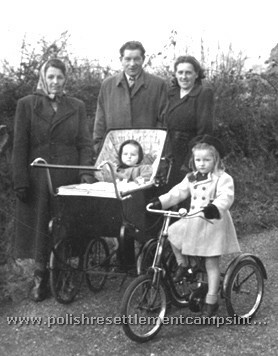 My uncle Tadeusz with his family were living in the area and that is were I met my wife Ingel Kołodziejczyk. Imagine our surprise when we discovered that we both lived in the camp as children. 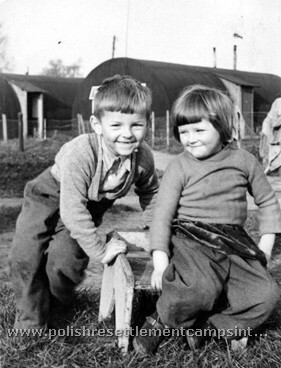 Ingel with her father Karol Kołodziejczyk Ingel with her mother outside their nissen hut Ingel by her home. Ingel with her mum and dad, Karol Kołodziejczyk lived on site 10. and she remembered seeing me been taken there and playing in the garden of my mother's friend. Who would have thought that 24 years later we would marry. 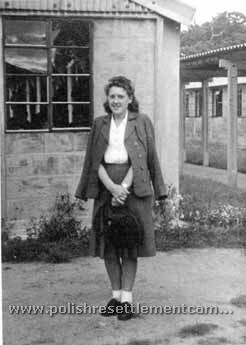 Ingel Kolodziejczyk outside her first home, a concrete hut. Outside the church Ingel Kołodziejczyk Irena and Lodzia Kaczmarska and Ela Dratwińska. Some of the children Ingel remembers:- Tadeusz and Ryszard Ludzinski, ? Lęmbicz, ?Kuczyński, Ingel, Ela Dratwinska. 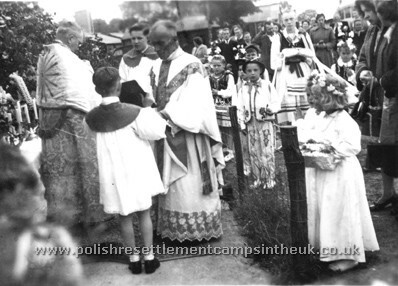 Looking at the pages of other camps, life in Tilstock/Prees camp does not differ from other Polish camps. We had a church and a priest, who looked after the spiritual needs of his flock. Fr. 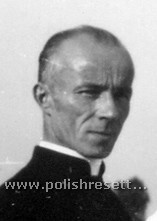 Piotr Paweł Niemira a survivor of Dachau concentration camp. 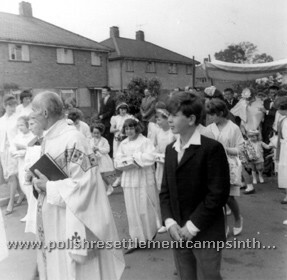 He taught us religious knowledge and prepared the children for their first Holy Communion and I do remember taking part in Corpus Christi processions. 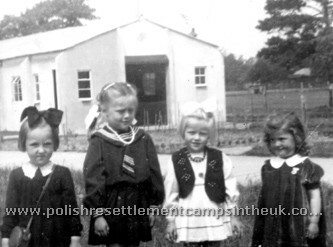 Although we all attending English schools in the area I remember having to spend Saturday mornings at the Polish school in the camp. 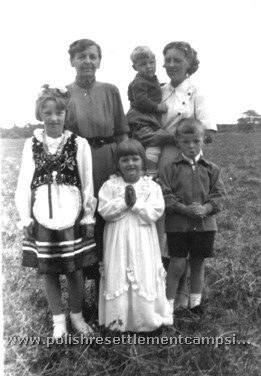 Photo on the right:- My sister Jadzia in national dress, Basia in her communion dress, my grandmother Helena Batowska, my mother with Roman in her arms and me Andrzej. Parents and children outside the church. Corpus Christi Procession with children in national dress. Zbyszek ? Zenon Batowski, Andrzej Chajdas, Tony Warczak. 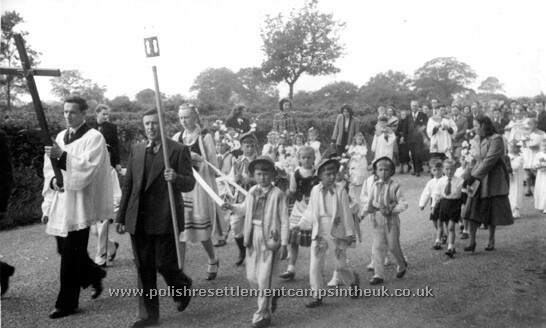 Today there is no sign of the nissen huts that we called home, just a ploughed field where, in the 1950s and 1960s, a tightly knit community of Polish displaced people lived. 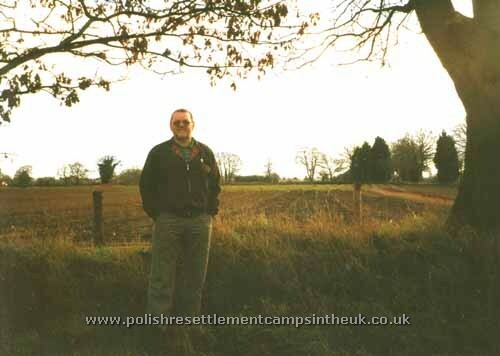 Ingel and I live not far from the site where the camp once stood and where we spent our happy childhood. The only visible clue that Polish people once lived in the area is a handful of polish grave stones standing in a quiet corner in Prees Cemetery. 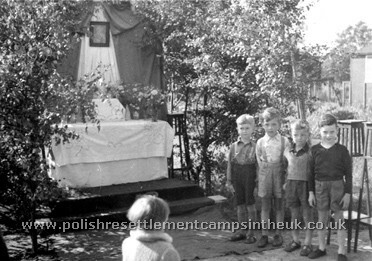 If you lived in Higher Heath Polish camp and would like to add information to the page please contact me.